KangaSpell provides an easy way to prepare, organise and store your spelling lists. It allows you to customize the spelling lists you want your students to learn and by typing one list, you automatically create 4 styles of spelling lists / activities. Before reading any further, please read this IMPORTANT INFORMATION. KangaSpell is a macro-enabled PowerPoint show which means it contains coding. When you double-click on the show, if a message appears asking to enable macros, it is important to do this or the show won’t function correctly. This has coding created in PowerPoint 2013 on a Windows machine and may not work on earlier versions of PowerPoint. KangaSpell WILL NOT WORK ON A MAC. BUT…. If your computer fits the right criteria, and you are after a time-saving way to compile your spelling lists… read on!! A secret slide allows you to create a list of 10 words as well as two options for incorrect spelling for each word. Once that’s done, click a button that populates those words throughout the PowerPoint and save it. Done! 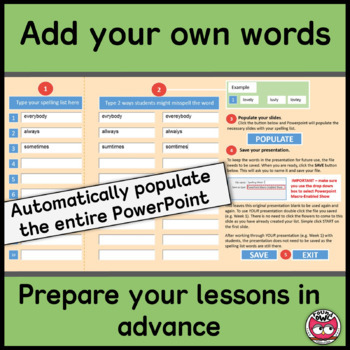 You can create as many PowerPoints as you need, organising your spelling into weeks or even into ability groups. 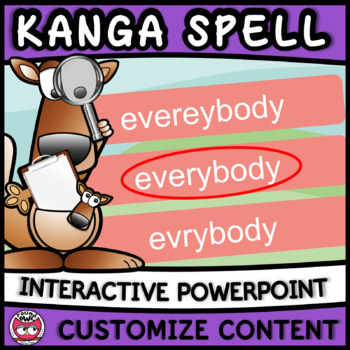 KangaSpell can be used with the whole class or with individual students. It’s organised into 4 sections but the sections do not need to be followed sequentially. List – This is a list of your spelling words on a single slide. Useful for introducing students to new spelling or as a list for students to copy from. Explore – This is a list of your spelling words with each word on one slide. This can be used to introduce students to the words individually and examine each word more thoroughly to help students learn to spell each word. Words can also be hidden so students have to write the word after examining it. Unhide the word for students to check. Spell - This activity follows the ‘look, cover, write, check’ method. When the ‘write’ icon is clicked, there is an option to type the word directly into the box. 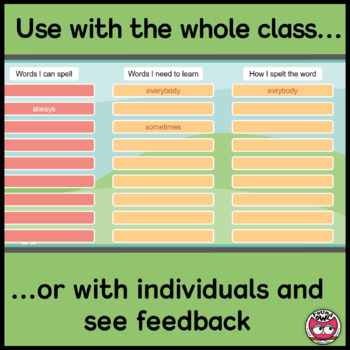 The Spell activity also provides a feedback slide where students can see what words they know and what they have to learn if they are using this individually. Choose - Students choose the correct spelling of the word from a choice of three words. This is an important spelling strategy. Misspelt words come from the list you provided in the customize slide. This activity also provides a feedback slide where students can see what words they know and what they have to learn. As with any zipped files you download, please unzip the folder before using its contents.